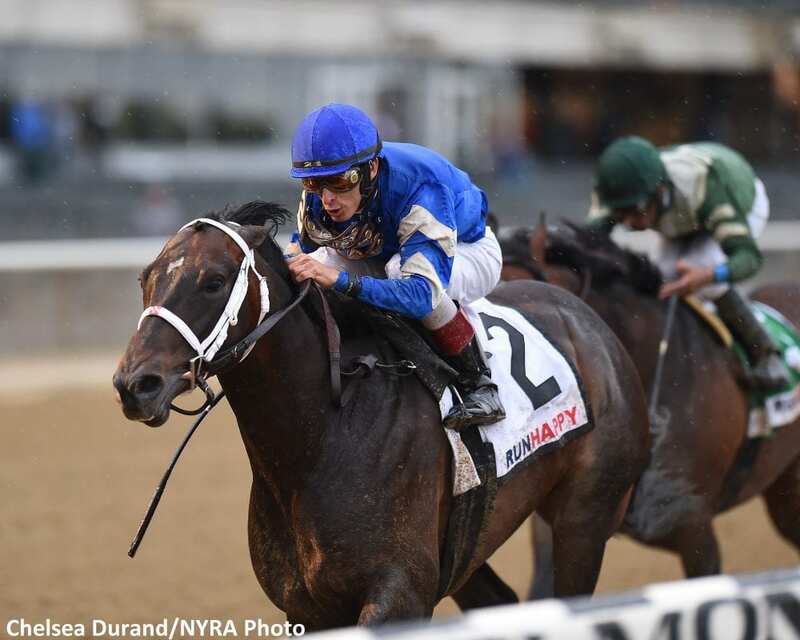 Making his eighth career start and first start since finishing third in the Grade 3 Commonwealth at Keeneland on April 7, Godolphin Racing's Westwood bested a field of six in the fifth running of the $150,000 Runhappy on Saturday at Belmont Park. Westwood departed from post 2 with Hall of Famer John Velazquez aboard and the pair stalked Skyler's Scramjet, who led through the opening first quarter-mile in 22.37 seconds with 45.46 or the half. As the field turned for home, Westwood made his winning move, shifting to the three path to pass Skyler's Scramjet. He held off a late-charging Always Sunshine and hit the wire first to win by three-quarters of a length earning Velazquez his fourth win of the day. His final time for the six-furlong race was 1:09.45 on a main track upgraded to fast. A homebred son of Bernardini, the 4-year-old gelding boosted his career earnings to $250,050 while picking up his first career stakes win. Skyler's Scramjet held on for second followed by Always Sunshine, Great Stuff and King Kranz. Green Gratto was scratched from the race. This entry was posted in Racing and tagged belmont, belmont park, Bernardini, godolphin racing, john velazquez, kiaran mclaughlin, runhappy, runhappy stakes, Skyler's Scramjet, westwood by Najja Thompson/NYRA. Bookmark the permalink.